Not an expert here, but I noticed a huge lens arc in the top right corner. Is this from NGC 6960 or from something else? None of my internet searches came up with any mention of a lens arc in this galaxy. NotAScientist wrote: Not an expert here, but I noticed a huge lens arc in the top right corner. Is this from NGC 6960 or from something else? None of my internet searches came up with any mention of a lens arc in this galaxy. Good question. However, NGC 6960 is not a galaxy. A galaxy is a huge conglomerate of stars, and large galaxies can be extremely massive. NGC 6960 is a supernova remnant and not particularly massive at all. What we see is gas that was blasted off the progenitor star when it exploded, and this gas is still speeding though space. The speeding gas from the supernova is colliding with the "interstellar medium", which is an extremely, extremely thin "gas" spread throughout the Milky Way. The collision between these two very different "gases" is what causes the glow. The arc in the upper right corner is not a lens, but simply an elegantly curved "collision front" which glows red from the energy of the collision. I bet the terms "narrow band" and "wide (or broad?) band" have been defined in previous APOD postings, but I'm curious about what these mean--the term "narrow band" being used in this description. I presume it's something like the range of wavelengths to which a CCD or other telescopic collector is "tuned" to capture...or something. Perhaps including a hyperlink--which is so often, and very helpfully, done with postings would be good here--though I understand that after hyperlinking a term 50 times you might assume readers would know it by now! Please know how terrific this site is, and how much I, for one, appreciate all of the work that goes into it. Extraordinary! sbraun wrote: I bet the terms "narrow band" and "wide (or broad?) band" have been defined in previous APOD postings, but I'm curious about what these mean--the term "narrow band" being used in this description. I presume it's something like the range of wavelengths to which a CCD or other telescopic collector is "tuned" to capture...or something. Perhaps including a hyperlink--which is so often, and very helpfully, done with postings would be good here--though I understand that after hyperlinking a term 50 times you might assume readers would know it by now! Please know how terrific this site is, and how much I, for one, appreciate all of the work that goes into it. Extraordinary! The bottom link is to the combined color picture of the filters on M27, one of my favorite objects. It is interesting to note the X pattern in the nebula...I had not noticed that before. Filters can show so much more details to an object. Followed a couple of the links, but have not seen any discussion of possibly having identified the central remnant of the supernova. Has anyone done that? Thanks! http://apod.nasa.gov/apod/ap121126.html - what? no central remnant?? https://en.wikipedia.org/wiki/File:Cygn ... abeled.png - the '+' marks the center. Whatever was there in 10,000BC is no longer. Good link, Boomer. That pretty much explains it. They can get quite expensive, for sure. Why isn't the Western Veil on the left? Is it labeled from the perspective of where the star used to be? Why isn't the Western Veil on the left? Is it labeled from the perspective of where the star used to be? The Western Veil would, however, be on the left (with South up) in the Southern Hemisphere since North & South are then reversed. Why would light from a source 1400 light years away require 10,000 years to travel to earth visibility? Should it not require 1400 years? 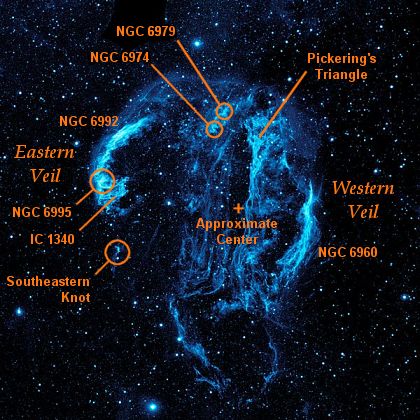 jdjensen17 wrote: Why isn't the Western Veil on the left? 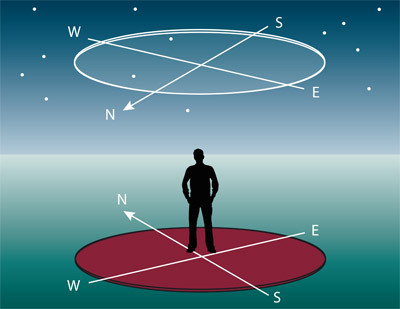 The Western Veil is on the right (with North up) because we look up at the sky but down on the Earth such that East & West are reversed. Why would light from a source 1400 light years away require 10,000 years to travel to earth visibility? Should it not require 1400 years? took 1400 light years to be observed on Earth 10,000 years ago. AvidAmateur wrote: Why would light from a source 1400 light years away require 10,000 years to travel to earth visibility? Should it not require 1400 years? The light that we see today started traveling towards us 1400 years ago: We see the nebula as it was 1400 years ago. 10,000 years ago there was no nebula, but a super bright exploding star. Since then, the remnant started fading and expanding, over thousands of years, into what we see today. This is an awesome picture. I love imagining our distant ancestors being amazed by a brilliant new star in the sky. Who knows what stories and traditions they may have handed down to their descendants? The Veil nebula is also a beautiful object through a large telescope under a dark sky, especially with an Oxygen-III filter that brings out the features that appear blue in Martin Pugh's photo here. Through a telescope our eyes don't perceive the kind of technicolor reds and blues you see in a long-exposure photo, but it does look faintly greenish. There's something magical about seeing it for yourself in real time and being able to zoom in and out and pan around to see different parts of the nebula. Mirrors don't switch anything. They merely reflect what is in front of them. It doesn't. Both hands are reflected in the part of the mirror that they are in front of. Are the two layers in the veil caused by the different atomic masses of the molecules ? Why the blue layer is above ? the different atomic masses of the molecules ? Why the blue layer is above ? and thus will be much less affected by magnetic fields. (about a northerly directed axis). For us dummies(specifically me), does that follow the right hand rule? does that follow the right hand rule? For all of us, actually. Last edited by neufer on Thu May 30, 2013 2:33 am, edited 1 time in total.